Fig. 1: Examples of acquired translucent liquids rendered lit under environmental illumination. 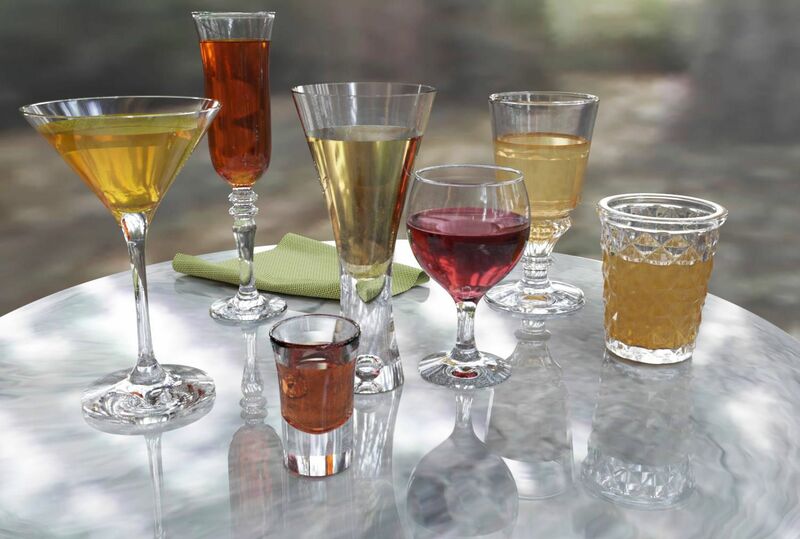 Left to right: cocktail (vodka+orange juice), cognac, whiskey, olive oil, rosé, apple juice, and mango juice. Abstract: We present a novel, practical method for acquisition of optical properties of common everyday translucent liquids using a simple acquisition setup involving an LCD panel. Previous work on acquiring liquids has required specialized procedures such as dyeing with a fluorescent agent (Ihrke et al. 2005), or dilution of liquid in a specialized water tank (Narasimhan et al. 2006) for acquiring its optical properties for rendering. In this work, we build upon our recent work (Kim et al. 2017) on direct transmission imaging for single-view reconstruction of axially-symmetric transparent objects such as glasses, goblets, carafes, etc. Many optically interesting everyday liquids such as cocktails, juices, whiskey, wine, oil, etc., are commonly contained in such axially-symmetric transparent containers. Hence, we propose a much more natural acquisition process where we image the transmission of backlit illumination through a liquid volume contained in such a transparent container to estimate its optical properties including its absorption and scattering coefficients, and refractive index. Publication: Practical acquisition of translucent liquids using polarized transmission imaging. Jaewon Kim and Abhijeet Ghosh. SIGGRAPH 2017 Poster.